Mario. Even at their best, Super marioworld was always a much better game than the sonic games. Although the Sonic games on MD were still great. 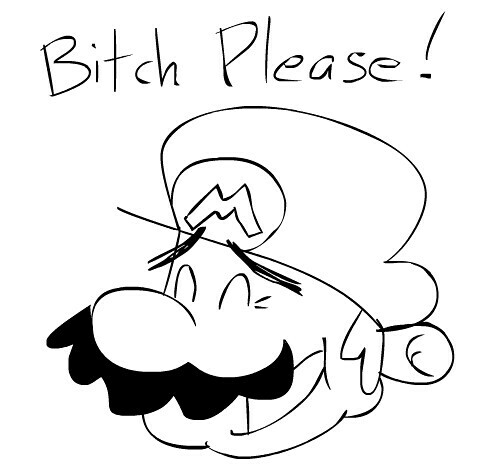 Mario because, there's no Sonic games on Gameboy or Gameboy Color. Mario for me. Mario games have been great since he was known as a carpenter called Jumpman in Donkey Kong, then battling pests from the pipes in Mario Bros., to all of his awesome adventures dating the past 30 years. I like Sonic don't get me wrong. But Sonic games were better on the Genesis. As the millennium began, Sonic games tanked imho. Gotta go with the plumber. The sonic games on the genesis where nice, but I think sonic as a character is just ridiculous, a 'me too' character to compete with Mario while ditching Alex Kidd. The last Sonic game I really enjoyed was Sonic Adventure 1 on DC. That being said, I still love the 16-bit classic Sonics more than any Mario game. Mario was is and always will win that battle in my book. I'm not surprised that Mario is winning, but I'm glad that it wasn't a landslide! Voted Mario due to the lack of a Kirby option. I love them both, but since the Genesis and Sega CD there is 5 bad sonic games for every 1 even okay one. Mario on the other hand churns out all time greats like its nothing. He started with an industry changer- Donkey Kong- and hasn't stopped. SMB, SMB 3, Super Mario world, SM64, Galaxy 1 and 2, Mario Kart, and even all of the Mario sports games, which are heavily underrated. Hmm, yes. But Mario is to Nintendo as Sonic is to Sega. Who would be Sega's character analogous to Kirby? I couldn't say. Edited by AceHart, Mon Jun 6, 2016 2:52 PM. It's an impossible decision for me. I wish there was an option called BOTH (But 2D games ONLY). I think I finally chose Sonic because if we agree that both had some great games, but look just at the characters themselves, well I just think Sonic is a little bit cooler than Mario. Still love Mario too, though. However, I think everyone who said Mario still makes great games had a great point. So I checked my gut instinct, without thinking and figured "Sonic", but just barely. It's funny that I've already overthought this as if it was something serious like the cure for cancer, but when I tried to figure out honestly why Sonic, I came up with my reason. And it is simply that I had more great memories of the time, centered around the Sonic games in the early '90s...Everything from playing it in my first apartment, (My first place without a roommate), to college memories, and as I said earlier, the music getting stuck in my head a little more than Mario. Why is this even close?